Every digital marketer seems to have their preferred social media management tool – we’re pretty sweet on Sprout Social over here at Website Magazine, but have some good things to say about HootSuite and several others as well. One of the solutions that has recently captured some attention (and respect from heavy social users like myself) is that of Buffer, an application that automatically schedules social media updates so they are spread throughout the day (essentially taking the guess work out of determining optimal posting times as the system schedules post when fans and followers are most active). 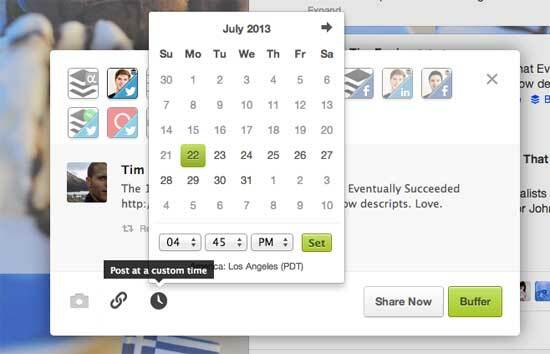 This week Buffer introduced Custom Scheduling, making it easier for users to post Facebook, LinkedIn and Twitter updates at a custom time of their choosing. The features works with both text and image updates and can be set up from desktop and on mobile devices. It’s not a revolutionary or groundbreaking addition to Buffer’s system (most social media managemetn tools already offer this), but it’s definitely something that will be welcome by its 800K users. Considering that Buffer just released some Business Plans (ranging from $50 to $250 per month), expect more new features to follow.